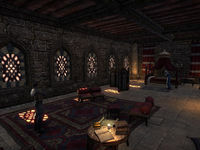 In Sentinel, the best way to hide out in plain sight is with a private room in the Sisters of the Sands, the town's largest inn. It also has the best food in the city, and is the place King Fahara'jad sends to for take-out. Sisters of the Sands Apartment is a player apartment in Sentinel. It can be purchased for 0001200012,000  after completing A Friend In Need, or you can purchase it for 00640640 (00800800 furnished) without completing the quest. 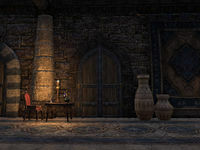 This apartment was added to the game world in Update 12, replacing a guest room in the tavern.